All necessary preparations for the first APEC Senior Officials Meeting (SOM1) have been completed after the SOM Steering Committee on ECOTECH (SCE), the SOM Friends of the Chair (FoTC) on Connectivity and the Policy Support Unit (PSU) concluded their final meetings on March 1. 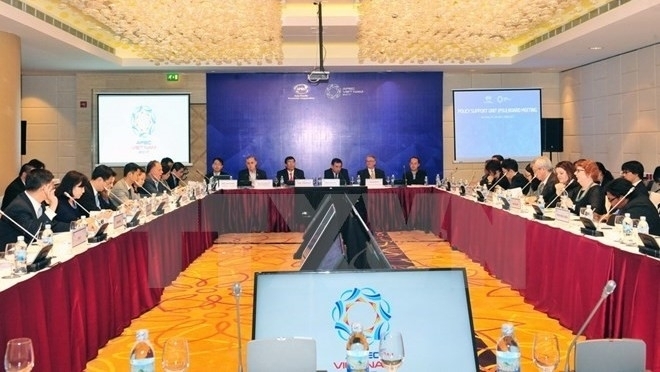 As the first event which drew the attendance of APEC senior officials, the FoTC meeting updated the progress of implementing initiatives to deploy the APEC Connectivity Blueprint. The delegates also discussed the implementation of the long-term plan on infrastructure investment and development as well as the APEC Services Competitiveness Roadmap. In his opening speech, Vietnamese Permanent Deputy Foreign Minister and APEC 2017 SOM Chair Bui Thanh Son stressed that enhancing connectivity will help create new dynamism for economic growth, promote inclusive development, strengthen regional economic links and bring APEC economies closer. The SCE heard a report on the APEC work plan presented by Executive Director of the APEC Secretariat Alan Bollard. On this basis, the committee re-examined and made recommendations to work plans in 2017 for its subordinate working groups. At its meeting, PSU re-examined the unit’s operations over the past year and projects currently underway. In 2016, PSU conducted 18 publications and reports. A number of research projects implemented by the PSU focus on structural reform, regional economic trends as well as promote digital trade to serve inclusive growth and industry support policy. Also on March 1, Executive Director of the APEC Secretariat Alan Bollard held a meeting with the media to share views on the context for SOM1 and discuss the outlook for policy collaboration between Vietnam and other APEC economies. Vietnam’s delegation continued making contributions to APEC activities by chairing the FoTC and PSU Meetings. On March 2, the most important event - SOM1 – will begin its two-day gathering.